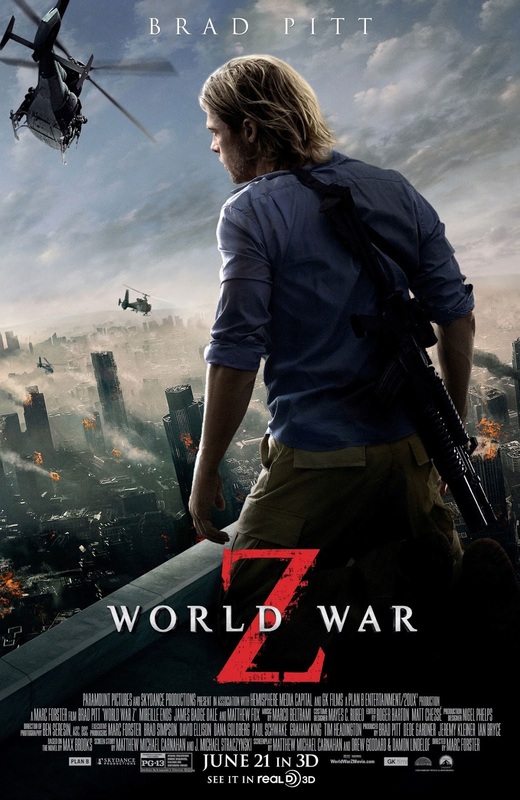 As Brad Pitt’s UN investigator Gerry Lane swoops over the city of Jerusalem encased in an enormous fortified wall, you are reminded of all that is wrong with World War Z. There’s a lingering generic-ism abound, one that stockily lumbers around without promise nor priority. When Drew Goddard, Damon Lindelof, Matthew Michael Carnahan and whoever else’s script this is attempts to overcome these commonalities, the film struggles to successfully juggle its grandiose ideas and instead is blighted by one or two gaping plot holes. Yet, before Gerry’s helicopter settles on the dusty plains below, you’re also privy to World War Z’s great elements. The magnificent visual landscapes on show. A sense of urgency that not only ensures problems are swiftly left hanging far behind, but also relents in tandem with the film’s menacing creatures. And also Brad Pitt himself, whose screen presence is a welcome, wholly capable one supported robustly by Mireille Enos. Occasionally frustrating, often energetic; World War Z ain’t all that bad actually. Having allayed his United Nations requisites in order to spend quality time with his family, a commute-turned-zombie attack must be the last thing on Gerry Lane’s (Brad Pitt) mind as he drives his wife Karin (Mireille Enos) and two daughters through a busy Philadelphia street. You get the sense he misses his old investigative job though, therefore it’s unsurprising that Gerry is speedily roped back into a life of danger and heroism, recruited by UN Deputy Secretary-General Thierry Umutoni (Fana Mokoena) to find the origins of the harrowing virus. Where did it come from? How can it be harnessed? These are apt, important questions demanding rapid answers in the narrative context, but questions that don’t quite elevate the film to any significant height. 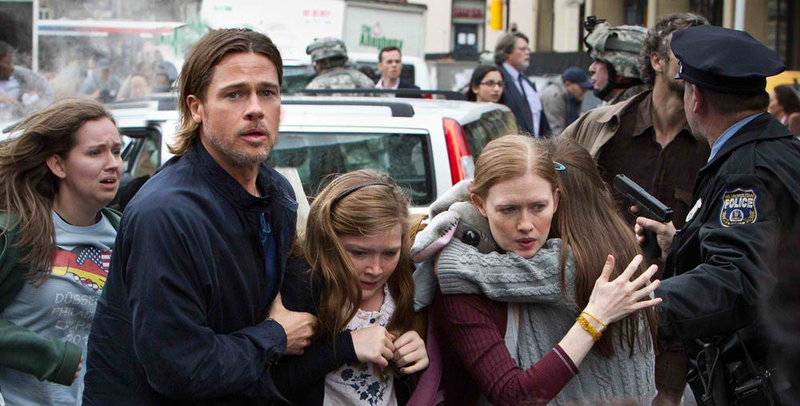 World War Z, then, suffers two-fold. One on hand its familiar formula reeks of a sterility, whilst characters and plot advancements are constrained by the formalities of the pandemic sub-genre. Instantly, the screen reels off a variety of intertwined media, life, death, disease images in a montage designed to propel the likelihood of ecological threat in a shrinking world. It’s quite clichéd, but just about works as a warning (or confirmation) detailing the film you’re about to watch. Then a hair-strewn Brad Pitt appears, assuring his daughter that he’s done with the ‘leaving home’ business and is now employed solely in the confines of his own four walls — of course those busy, reminiscing eyes say something a little different. And after five minutes, you know exactly what you’re going to get: a rampant, solid action flick. This isn’t necessarily a negative, a ‘rampant, solid action flick’ will often conveniently fill up a few hours. What works, works, right? At times though, there’s an inherent over-predictability that, shuffled in lesser hands, could be construed as laziness (a taped arm will probably get bitten; a family left behind will more than likely come off worse for wear; a semi-retired family man will leave loved ones in the time of need). These oh-so-common nuances do not affirm laziness though, because it’s evident that the conglomerate of director Marc Forster, actors and writers do care about the film they’re unstably constructing. Here’s the second problem then. In caring, and in striving to cast aside generic formulae, the film unwittingly jumps around, up, down and all over. Big surface ideas fall foul of gaping discrepancies, and there isn’t really a specific overarching tone, rather a number of intermittent murmurings. As a tormented, abrasive group of zombie-humans trample through the streets of Jerusalem, you’re watching (and probably enjoying) that ‘rampant, solid action flick’. But later, when Doctor Who appears and, stopping short at TARDIS-ing back in time, signals an atmospheric switch to one attempting Danny Boyle-esque tension. That’s not forgetting the splatterings of humour (the “Mother Nature is a serial killer” diatribe is oddly built on comic undertones) and misplaced masculine camaraderie throughout. Individually these tonal constructs are more hit than miss, but collectively the mishmash is a tad sloppy. There’s also a significant plot-contrivance that perhaps stems from this rewrite plague that the film suffers from. The whole of Jerusalem is surrounded and protected by a gigantic wall, the idea being that Israeli officials were aware of the forthcoming viral attack and therefore planned ahead. The reason we are given explaining their premature knowledge is that these officials worked on the basis of a ’10th Man’ theory — where the assumption is that this 10th man (of a consistent group of 10, obviously) would always disagree with every unanimous decision agreed upon by the other nine, and then work to prevent the seemingly unpredictable. Essentially, this time the 10th man came across the virus, and that’s how Israel was alerted early. The issue then is, firstly, are we to believe that this earth-shattering discovery was successfully kept secret from the rest of the world? Secondly, if the 10th man always goes against the grain harvested by the other nine, wouldn’t his subsequent research always uncover (and thus prevent) past tragedies, therefore no global, human-based, disaster would ever have happened? Come on. I digress. This is not a bad film, it’s only because the plot could’ve been tighter and the tone could’ve been structured and therefore the film could’ve been far better, that its weaknesses divulge frustration. For it looks incredible. Each visual is well-developed and astutely executed. In particular, there’s a tidal wave attack scene that’s ominous, turbulent and exceedingly well done. There’s also a sizeable amount of looking down at burnt, destroyed cities going on, although the terrific special effects anoint this a positive rather than a negative trait. And all of the fast-paced, energetic actions sequences deliver. In fact, Forster makes a point to move away from the early stereotypical set-up by quickly flashing the aforementioned disaster-threatening montage and then driving head-first into a bellowing helping of action. These popcorn scenes do provide the majority of the film’s strengths, however on a few occasions there is a sense that Forster et al are striving to do more with the morality of said pandemic. A dancing moral stance that could’ve gone further, but one that flickers intelligently ever so often. This virus has spread worldwide, but what happens to civilizations in areas without sufficient protection, areas not ready and alert in their security measures? At one point we’re told “[it’s] pretty obvious nobody back home read it” in response to questioning over an email that circulated eleven days prior with the word “zombie” embedded. Is this a thinly veiled reference towards prior real-life mistreatment of threatening politically-bound documents? And are these creatures really zombies, or affected, compromised humans? They still wear human features, only now are assisted by growling eyes. In an interview, Brad Pitt recalled his reasoning for seeking out the source material (of which his production company Plan B Entertainment secured the screen rights to). Effectively, something for his younger sons to watch and enjoy — apparently they like zombies. World War Z suffers from a number of faults, but it also boasts a few excellent aspects too and, at the end of the day, has been made with good intentions. Hey, I’ll have whatever Brad Pitt’s children are having. Was a lot better than I expected it to be, however, the script tears it down from being amazing. Good review. That’s it yeah. Too many writers/re-writes hampered its validity, but elsewhere the film delivered pretty solidly! Thanks Dan!